With a stay at Boutique Guesthouse Hanover in Hanover, you'll be a 2-minute walk from Hanover Museum and 6 minutes by foot from Trappieskop. The front desk is staffed during limited hours. Free self parking is available onsite. Located in Barkly West, Die Olyfhuis is a 5-minute drive from Canteen Kopje and 6 minutes from Barkly West Museum. Free self parking is available onsite. When you stay at The Zunguness in Karkloof Nature Reserve, you'll be 12 minutes by car from Benvie Garden. The front desk is staffed during limited hours. Free self parking is available onsite. When you stay at Masibambane Guest House in Rustenburg, you'll be 11 minutes by car from Waterfall Mall. With a stay at Shanka Villa in Cape Town (Hout Bay), you'll be a 1-minute drive from World of Birds and 8 minutes from Sandy Bay Beach. Free self parking is available onsite. 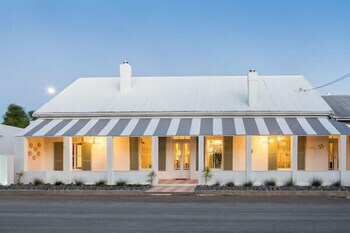 Located in Langebaan, Makarios B&B is a 5-minute drive from Langebaan Lagoon and 9 minutes from Langebaan Beach. Free self parking is available onsite. With a stay at Franschhoek Travellers' Lodge - Hostel in Cape Winelands, you'll be within a 5-minute walk of Franschhoek Wine Tram and Franschhoek Town Hall. Free self parking is available onsite. With a stay at All Are Welcome in Brakpan, you'll be within a 15-minute drive of Mall at Carnival and Royal Oak Country Club. Free self parking is available onsite. With a stay at Kenjockity in Hermanus (Westcliff), you'll be within a 10-minute drive of Whalehaven Winery and Voelklip Beach.